Beer-encrusted carpet, why hast thou forsaken me? I shall quietly grumble about this no more. The time has come for a wobbly to be thrown ungracefully across the laminated floor tiles of the internet about a terrible injustice being done to our nation’s fauna and flora. As the hedgerows are decimated, another important ecosystem is dying. An unsavoury and slightly scary one and one I would not want to put my face near (then again I’m not that keen on having my nose bitten off by a badger, either) but one that is necessary for certain aspects of modern life: the pub carpet. Many things have counted towards the pub carpet’s demise; the smoking ban meant that the rank perfume of a Carling-soaked rag on Sunday morning took on the role of an aggressive olifactory vomit-hammer rather than merely being the undertone to an ashtray. Realising the grossness of the thing that had been living on their floor for years, landlords ejected this malodorous punter rather than face the horror of cleaning it. It seemed the kindest thing to do, perhaps. Wrong! The pub needed that rug. The same for the tobacco-stained, tar-encrusted flock wallpaper. The smell and feel of them may have grated against the unfogging of the 21st Century boozer but they weren’t just there for nostalgia’s sake. 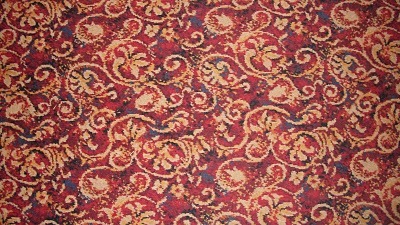 The thing which pubs don’t seem to have appreciated, regarding all these soft, absorbent surfaces was not just that drunkards are far more likely to slip on varnished floortiles than a proper paisley print flock and underlay* is that it was essential if you didn’t want your pub to be totally filled with braying wankers. No no, not just a style thing- braying wankers are everywhere, especially in London but if you rip out the soft furnishings in a place and leave tables unpartitioned then an acoustic transformation takes place. The current fashion for minimalism has led to a decimation of sound-absorbing surfaces, freestanding chairs and tables scraping past punters standing up to drink their £4.30 pints. This creates an enormous echo-chamber, with nothing to dampen the noise and so if you have more than 10 people in the room, everyone begins to bellow to compensate. Add to this music at any volume and the ricochet of noise becomes almost unbearable. A good, noisy, bustly pub is one thing- the Newton Arms, Holborn, for instance, can get rammed and be very pleasantly shouty but the crescendo of noise in a pub stripped bare leaves you barely able to understand people more than two feet away. I am slightly hard of hearing in any case but the enormous roar of a room full of drunkards, a percentage of which somewhere between 5 and 75% will be braying idiots at any time, is an unearthly din over which to try to have a Proper Old Man Pint. Perhaps I should move with the times but it seems unfair to accompany a hangover with tinnitus if I haven’t added Rock Neck for the holy trinity. Thus: landlords and ladies, I beseech you, BRING BACK THE CARPET before we all go deaf and the only pub customers left are hollering rugby fans. *I am one of the Freakytrigger writers most likely to be found wearing HEELS in a pub and can tell you that the chance of me sloshing my pint everywhere is greatly reduced by the surface being non-reflective. I’m not saying everyone has to cater for my footwear needs but the evidence of yr correspondent’s last venture into the New Look shoe section suggested that the more wimmin you get in the Brew Dog concrete pen the more you’re likely to need a mop and crutches handy.